Photo by our dear friend Kirstie Shanley. 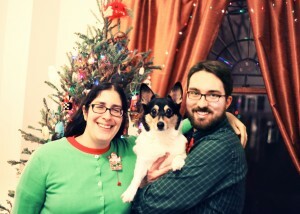 Happy holidays from the BooHaus Family. Katniss not pictured because Tilda would have tried to eat her. Christmas at the Hansen’s was great. We had the big dinner Christmas Eve and then had Christmas breakfast at 9:00am. Z and I headed home from Cleveland early because a giant snowstorm was heading straight for it, so we got back to Chicago Christmas night. Since we had already requested the PTO off, Z and I ran a whole bunch of errands. I went to the post office to mail some LAK lacquer I had sold [funny enough, it went to an acquaintance whose future mother-in-law had purchased it for her]. I set up my new phone at T-Mobile. Exchanged a purchase at Kohl’s. Grocery shopping at Jewel. I picked out my new glasses [Shuron NuLady in Crystal Brown] from Labrabbit. They weren’t the vintage frames I went all swoony for last week, but they are very me and will look nice. Went to Kimmi’s bday party Saturday. Today we took down the Christmas tree and decorations, slightly rearranged the living room, and did some general clean-up. Also this week, I started watching The Walking Dead. I watched Seasons 1 and 2 and I am fully into it. Z watched the first five episodes with me and gave up because he said it reminded him too much of LOST. The further I got, the more I agree with his statement. It is a lot like LOST, which is probably why I am enjoying it so much. Funny though, because I have never been a huge fan of zombie movies, books, games, etc. Kind of like how I enjoyed Friday Night Lights but avidly hate baseball (& most sports). I enjoy watching the relationships, but every time there is a walker attack, I can barely watch. End of year post/2012 resolution wrap/2013 resolution list coming on Tuesday. This entry was posted in Week Wrap by Leigh. Bookmark the permalink.